Hollywood at your fingertips: that’s the main selling point at this unfussy chain which offers a backyard pool, jacuzzi and on-site restaurant. 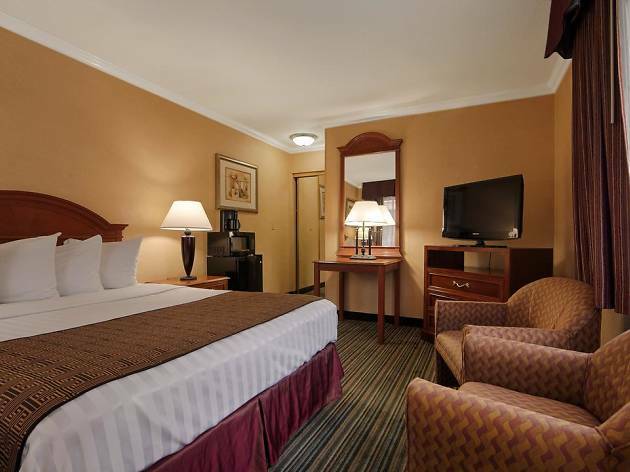 Rooms are a little dated, but the service is reliable and you can’t beat the price. Just below the 101, this vetted budget option makes the case for an unrehearsed, on-the-fly, hassle-free Hollywood hop. It’s close enough to the glitz of Hollywood Boulevard that you feel part of the scene, while also never straying too far from the freeway so you don’t add unnecessary travel time navigating the big city. The set-up is fairly straightforward: a 24-hour front desk that’s equipped to receive newcomers all night long, and access to convenient parking on-site (for a fee). There’s even a tour booking office, so hotel staff can help you plan an excursion to Disneyland, secure tickets to a nearby theater, or even rent a car while you’re in town. Amenities come in the form of an outdoor pool with a jacuzzi and some outdoor patio furniture; there’s fragrant foliage all around the pool area, offering a peaceful haven after your travels. The 82 rooms are modest, but by no means unpresentable, with generic wall art and monochrome bathrooms; satellite TV, free Wi-Fi and air conditioning are all part of the package. 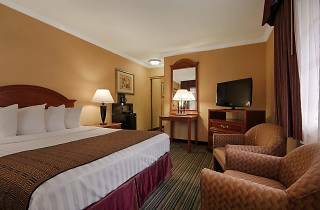 Location: The Best Western Hollywood Plaza Inn sits north of the main Hollywood strip, and within walking distance of bars, restaurants, and sightseeing spots along Hollywood Boulevard. It offers easy connection to both the 101 freeway as well as the Hollywood/Highland metro station, which connects to other parts of Hollywood and Downtown L.A.
Hollywood & Highland: Three blocks from the hotel, this bustling shopping center has a little something for all, from Dave & Buster’s arcade hall to Victoria’s Secret to the famous Dolby Theater, where the Academy Awards takes place each year. Mel’s Drive-In: This bright Googie icon, which is a 9-minute walk from the hotel, once housed the rock-and-roll coffee shop hangout Ben Frank’s. These days, you’re more likely to find hungry late-night tourists scarfing down burgers and trying to spot celebrities, but that makes this 24/7 diner no less enjoyable. Jimmy Kimmel Live! : Show up at El Capitan Theatre, nine minutes from the hotel, to attend a taping of Jimmy Kimmel Live! The talk show, which tapes Monday through Thursday at 4pm, offers a diverse line-up of guests, as host Kimmel susses out his takes on pop culture and world events. TCL Grauman’s Chinese Theater: Walk ten minutes and you’ll be at the doorstep of this famous movie theater, which reopened after extensive renovations in 2013, and offers one of the largest IMAX theaters in the world. Good for: Anyone looking to do Hollywood on a budget will be appeased by the Best Western’s convenient in/out access, as well as its free hot breakfast and mild rates. Night owls and urban explorers will love the selection of bars and buzzing energy of the Hollywood Strip, just 10 minutes from their room. Time Out tip: While there are no minibars in the rooms, a liquor store across the street from the hotel means you can pregame, Mick Jagger-style, without having to trek too far. The bottles won’t be miniature-sized, but that just means you have to buy less of them.